The beginning lap swim class is for adults who want to improve their swimming so they can start lap swimming as a regular form of exercise. Can you swim the length of the pool (25 yards)? Do you find yourself out of breath at the other end of the pool? Do you want to learn another stroke (breaststroke, backstroke, butterfly)? 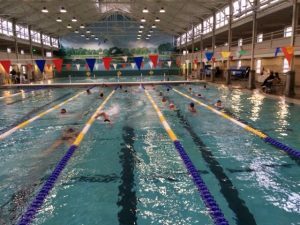 We will focus on technique and endurance swimming freestyle (front crawl) while learning lap swim etiquette and other strokes. For those who are interested, you can transition into the Masters swim program. You must be able to swim 25 yards continuously – any stroke, any speed. Cost is $60 total. Class fees must be paid on or before the first class. The sessions are twice a week for 3 weeks for a total of 6 lessons. This program runs continuously on Tuesday and Thursday from 6-7pm. Private lessons/coaching is also available. Sign up with your coach. All fees must be paid prior to private lessons. Click here to pay swim fees using our online store. Contact us at christina@richmondswims.org for questions or to sign up.